A while back, on my trip to New Orleans, my son Lee and I were in Crescent Park, hanging out for a few minutes, looking at the giant muddy expanse of the Mississippi River and the ships, tugs, and barges cruising past. A guy in an open-water kayak paddled by, going downstream, and I snapped a photo, wishing I had my longer lens. Other than the familiar automatic action of raising my camera and pushing the shutter, I didn’t think any more about it. It didn’t take much internet searching to learn that this was Ryan Caruso, kayaking a thousand miles from South Padre Island Texas, to Panama City Beach Florida, to raise money for Operation Smile – a charity to provide needed surgeries to children around the world. By 8 in the morning, my sailboat friend, which I finally learned his name but I will call him whom I’m calling “Military Man,” caught me up. We talked for a moment before he passed me once again. A half-hour later, I had entered the industrial harbor of New Orleans. For 5 miles, I passed barge push boats (no barges just the boat), sitting along the channel being fixed or repainted or pulled from the water to inspect the haul. I radioed to the Harvey Locks letting them know I was five minutes away and slide in almost immediately into the lock. The guys running the lock were very interested in the voyage, and I explained as I always do what I was doing and why – it’s all for Operation Smile. They told me to make sure I updated New Orleans Traffic Control when I got onto the Mississippi. The lock filled with water and only my kayak, as the lock was empty besides for me, rose 6 feet so as to be level with the mighty Mississippi before the lock doors opened. One of the gentlemen of the lock lowered down two cold water bottles with the caps tied to a rope. The key to my heart – well, two keys to be precise. For the next hour, I left the radio on to channel 12 so I could listen to water traffic on the Mississippi. I heard a lot of the barges talking about the “kayaker.” They must have had a hard time seeing me because other boats would always have to update different boats of my location. I was asked to wait while a ferry boat started up and took of into the center of the river but after awhile I safely entered the inlet for the industrial lock. A barge with chemicals was currently entering the lock and since no other boats can accompany barges with dangerous chemicals I was forced to wait. My sailboat friend was there, and the lock had told me to enter behind him. Military Man had been waiting for an hour and together we had to wait another one. I pulled off the ICW after only 26 miles. I found a spot where the wake barrier rocks had fallen away and I slid into the main land. These rocks make landing impossible if I don’t want to destroy the haul of my boat. Yanking the boat through thick marsh and tall grass, didn’t take long and soon I was walking the 15 minutes to the main road. Upon reaching the main road, I only had to wait a minute or two before my Uber arrived to take me to Walmart. I feasted on Taco Bell across the street – since there was no Cajun restaurants near me – and then made my way to Walmart. As I waited for the Uber back to my kayak, rain came down like I hadn’t seen in days. I dove into the passenger seat as the rain hammered the window. By the time we made it back to my hidden kayak, the rain had stopped and I slowly made my way back down the old forgotten gravel path. After arranging the food into dry bags, I realized I may have bought too much. I guess I will know tomorrow when I pack the kayak in the morning. I leave the safety of the ICW for the next 5 days, tomorrow. Hoping for calm winds and no stories to write about. So when Lee and I saw him, he was following the Gulf Intracoastal Waterway. He had entered the Mississippi at the Harvey Locks a bit upstream, and was paddling down the river past us until he reached the Industrial Canal Locks only a bit farther. At that point he would leave the river and enter the channels of the Intracoastal Waterway again (and stop to take an Uber to Walmart for supplies). What an amazing thing. 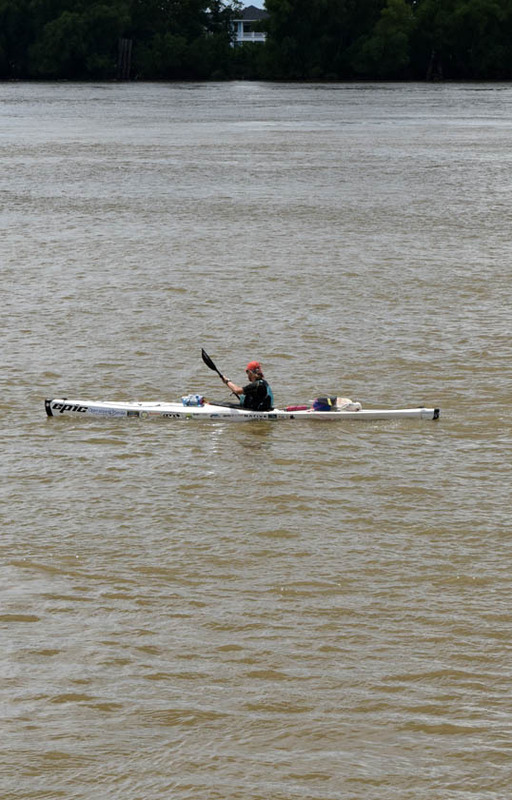 First, his kayak voyage – an impressive feat. Add to that the fact I, from only a glimpse of a kayak on the river, could track down the whole story while sitting here at my laptop. 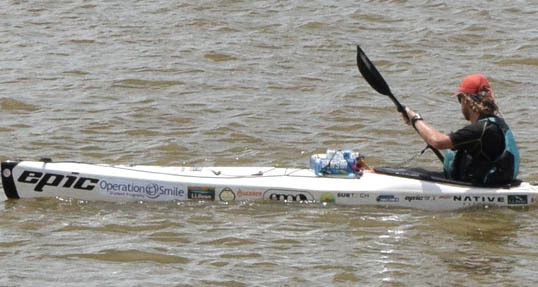 This entry was posted in New Orleans and tagged charity, intracoastal waterway, kayak, mississippi, operation smile, Photography, river, ryan caruso, voyage. Bookmark the permalink.